Genesis 32:22–32 records a story in which the Hebrew patriarch Jacob literally wrestles with God. That is, God comes down from heaven in the form of a man to engage in some hand-to-hand combat. Oddly the text tells that Jacob wins the fight, though he does walk away with a limp. Jewish artist Arthur Sussman portrays this episode as a whirl of wings and arms, flailing, flapping, legs planted and upturned. The focal point is the face of Jacob, clearly struggling but still holding on tightly. Above his head is an orb of light, signifying the break of day (Genesis 32:26), by which Jacob will be able to see his opponent’s face for the first time. This painting doesn’t capture just one moment in the narrative but many moments superimposed on one another. However, amid all the motion, Jacob’s face remains fixed in an expression that seems to indicate that he is almost at the point of surrender. I imagine that this particular freeze frame captures the moment at which God pronounces his blessing on Jacob, right after he has given him the new name ‘Israel’ – ‘he who strives with God.’ Jacob is looking upward and inward as he realizes that validation, blessing and victory come from God alone, not from earthly fathers and definitely not from his own cunning. I love this story because it commends wrestling with what you do not understand. In the Jewish tradition this practice is upheld as an essential faith-builder. The nation of Israel, after all, gets its name from the story. But sadly such wrestling is discouraged in many Christian circles. Some Christians will tell you not to push against God, not to question him or demand things of him, to just submit without a fight to what he decrees in his good wisdom. If you want to approach God in your anger, your frustration, your confusion, you better be careful about it, they warn. But here Jacob received a blessing precisely because he wrestled, because he so openly and persistently demanded that God deliver on his promises. Even when God injured him, Jacob did not let go. And God rewarded his fighting spirit. The Bible even says that Jacob won the fight; he ‘prevailed’ over God. How can this be? Hosea 12:4 gives us a clue: ‘Jacob strove with the angel and prevailed; he wept and sought his favor.’ This verse suggests that Jacob prevailed over God through weeping and supplication. Paradoxically, he won when he lost and knew it. His surrender was his victory. Charles Wesley wrote a beautiful fourteen-stanza hymn on this story (Come, O Thou Traveler Unknown) that shows the tenacity of Jacob to know God’s name and nature. He wrestles with what he cannot see and eventually receives his answer: God’s name and nature is Love. Sussman’s painting reminds us that our God is a God who is willing to fight with us until daybreak. Although he is infinitely more powerful than us, he comes down to our level so that we can have direct contact with him, and he holds back the full force of his strength so that he can engage us in a match. He’ll indulge our feeble clinch holds and leglocks and other maneuvers and turn it into a bonding experience. He may even counter with some moves of his own to toughen us up. In the painting God’s various sets of hands are breaking Jacob down and holding him up. Some of his faces speak gentleness, some fierceness. Whatever mixture of approaches God may use on us, his goal is this: to bring us through our brokenness to a place of blessing and glory. 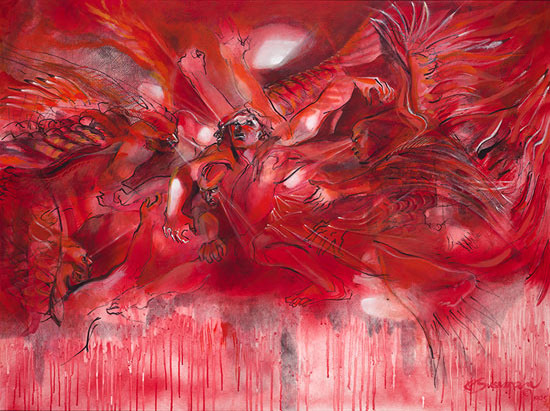 Arthur Sussman, Jacob Wrestles the Angel, 1995, 120 x 90 cm. Victoria Emily Jones lives in the Boston area, where she works as an editorial assistant at Shambhala Publications, Inc., a publisher of books on Eastern religions, philosophy and art. In 2010 she received a BA in journalism and English from the University of North Carolina at Chapel Hill. A year later she founded thejesusquestion.org, a website where she explores various conceptions of Jesus in the visual, literary, performing and musical arts, as well as in popular culture and in churches around the world.